Congratulations to my brother, Grayson J. Smith, for being awarded the The 5th Avenue Theatre’s First Annual Subscriber Choice Award for Outstanding Young Actor for his performance in Oliver! 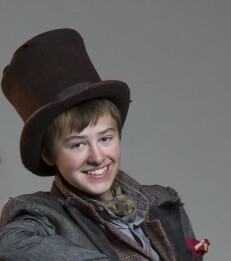 as the Artful Dodger!!! Congratulations to our family friend, Anthony Rosenthal! My brother, Grayson J. Smith, was in Oliver! at the 5th Avenue Theater with Anthony last year. 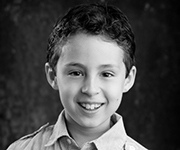 Anthony was recently cast in the Newsies North American Tour, which begins October 11, as Les! We are so excited for him! See the full cast here. The 5th Avenue Theatre was designed and planned in 1924. The interior of the theatre was designed by Gustav Lilijestrom. The architect was Robert C. Reamer, also the designer of The Fox Theatre. By October 1925, construction began and totaled to $1.5 million dollars. On September 24, 1926, the 5th Avenue Theatre had its grand opening. The end of World War I Armistice celebration was said, by newspapers of the time, to be smaller than that the crowd in attendance at the grand opening of The 5th Avenue Theatre. From 1926 to 1930, The 5th Avenue Theatre served as a stage for shows by the Franchon and Marco Company. The theatre was Seattle’s downtown premier movie venue. In 1978, after years of struggle due to diminishing crowds, The 5th Avenue Theatre closed its doors. The following year, community leaders and companies raised funds to renovate the theatre. The renovation would take two years, and cost $2.6 million dollars. Following the construction, the theatre successfully produced Annie, which ran for 10 weeks. Recession from 1983 to 1989 caused many theatres to close. The 5th Avenue decreased staff, and remained open for community and locally promoted events. For ten years starting in 1989, the theatre successfully ran 10 seasons of musicals. One of the most successful shows at The 5th Avenue was Les Miserables, which the theatre has produced 9 times in the past 22 years. Today, The 5th Avenue Theatre produces about 7 shows a year, as well as special events. The theatre not only presents Golden Age and Contemporary musicals, but also premieres new musicals. Shrek: The Musical, which ran for 441 performances on Broadway, and A Christmas Story, on Broadway in 2012, are only two of the shows that premiered on The 5th Avenue stage and proceeded to go to Broadway. Disney’s Aladdin will run on Broadway in 2014 after the 5th Avenue premier of the show in 2011. The 5th Avenue Theatre continues to provide the Northwest with Broadway quality shows. The 2013-2014 season includes two new musicals. The musical adaptation of the movie Secondhand Lions will take the stage this August, 2013. Along with the usual productions put on at the 5th, the theatre also has a large education program for all ages of students. This program includes workshops for students interested in all aspects of musical theatre, summer camps, and classes, all taught by professional actors of Seattle. The 5th Avenue Theatre had repairs from various earthquakes in 2003, and a new marquee built in 2008. 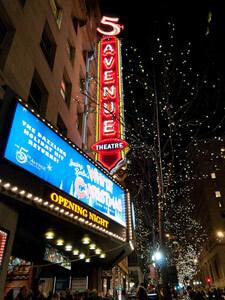 The non-profit organization of the 5th Avenue thrives as the largest theatre in the Northwest.